Mortgage rates since Wednesday have jumped, today pressing on 5.25% for lowest-fee loans… but, other than dazed lenders, nobody knows. “If a tree falls in the forest, and there is no one nearby to hear… will it make a sound?” In this case, silence. Who wants to be the first lender to speak? The financial press has covered the explosion in the 10-year T-note, the mechanical driver of mortgages, but not mortgages. 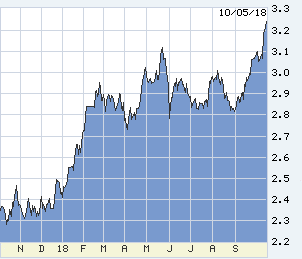 The 10-year had spent seven months on a centerline of 2.90%, touching 3.00% a few times, but suddenly today trades at 3.23%. Why won’t the big press, WSJ et al report mortgages above 5.00% for the first time in eight years? Because editors do not trust mortgage lenders to describe rates; they assume that we are all self-serving fibbers. The big media cover mortgage rates only as Freddie Mac releases its survey on Thursdays — yesterday a comically inaccurate “4.71%” with “.4%” in loan fee which few consumer pay but further understates the survey rate. Freddie’s weekly survey has been definitive since 1971, but Freddie has not adapted to reflect market changes in the last fifty years. Not at all. In the ‘70s, conventional mortgage rates were set by individual S&Ls based on the cost and supply of deposits, and rates could stay unchanged for weeks. Both the FHA and VA posted a single rate for each loan type, which might stay the same for months, “points” varying with trading in early Ginnie Mae MBS. Since roughly 1983 retail mortgage rates have been the constantly resetting, real-time, intra-day throughput of mortgage-backed securities driven by 10-year T-notes. Freddie surveys mortgage rates on Mondays and Tuesdays, missing any market movement later in the week but reporting rates as fact on Thursdays. This week’s survey lag has been epic. If rates hold here, next Thursday Freddie will discover the week-old rocket above 5.00%. Until then, according to the big financial media, nothing has happened. This sudden move begs a few other questions. Why? How far? And how much can housing take? There is of course some argument about “why.” The economy is strong if not on fire, the twin surveys from purchasing managers (ISM) at super-cycle highs. Some say the bond market was spooked by Amazon’s new $15/hour minimum wage, but paying up to attract high-productivity workers is not inflationary. Others worry about the rise in oil from $60/bbl to $75, but the jump is certain to create more production and limit demand. In recent decades the global economy has adapted to oil surprises in non-inflationary ways. A catalyst for Wednesday’s rate surge was ADP’s strong forecast for today’s report of September payrolls. But even that news (confirmed in the actual report this morning) was continuing strength and not acceleration. Old news. The last “cause” of the bond market fright is the tsunami of new IOUs from the Treasury to fund our new trillion-dollar deficit, $100 billion next week alone. I hear all of that, but I don’t believe it. This bond wreck is the Fed’s work, and I expect that they are partly pleased. It bugs the Fed when long-term rates do not rise when the Fed jacks short rates (see “Greenspan’s Conundrum, 2002-2006). The Fed’s purpose in hiking the cost of money is to remove stimulus or to slow the economy, and the impertinent bond market is supposed to comply. Long-term bonds move in response to inflation, and we don’t have that. But a sufficiently aggressive Fed can bulldoze long-term rates upward, inflation or no inflation. 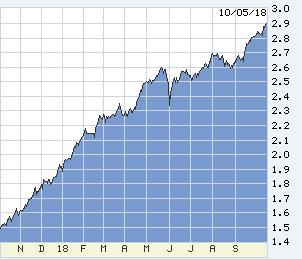 In the last three years the Fed has nudged upward from zero to 2.25% last week, but must react to this hot economy and pre-empt the risk of inflation. The Fed is doing the right thing, but right things have consequences. 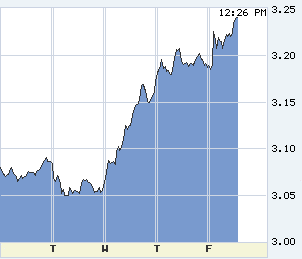 The explosion in long rates this week is a reaction to changed and more aggressive Fed policy. 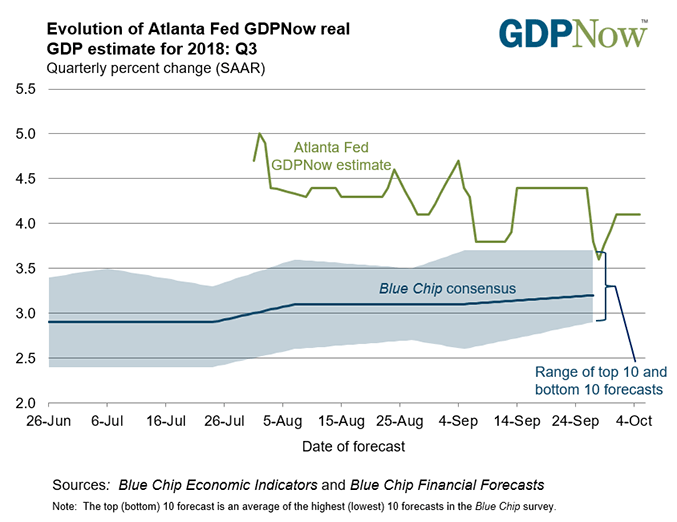 The Fed never said explicitly that it would pause its hikes next spring when the cost of money reached neutral near 2.75%-3.00%, but that was the prevailing market theory and supported by a lot of Fed chatter. In the last two weeks from Powell on down the Fed has dismissed the notion of “neutral” and embraced “outcome-based policy” (brilliant Evans at the Chicago Fed). The desired outcome now? The economy will either slow to 2% GDP and job creation by half, or the Fed will hike .25% every 90 days until the economy complies. This is the right policy. However, it has destabilized the bond market and put at risk the Fed’s whole “gradual” approach. Just arithmetic: buyers of 10-year T-notes will not buy at rates below the overnight cost of money, nor where it’s going in a year or two, not until we see the recession coming. 10s could stay happily near 3.00% if reasonably expecting a pause near 2.75% next spring. Forget that. If the economy does not slow of its own accord, by next December five more hikes will put the Fed at 3.50%. Why would I buy a 10-year IOU paying less than that? Long-term money thinks long term, and brings the future into the present. Hence long-term rates are now upside unstable, an inevitable risk during any tightening cycle. These forces will limit the rise in long-term rates: still-low inflation, and extremely high US rates versus the rest of the world. Broken crockery — stocks and housing — will not stay the Fed until the economy slows. Where is the mortgage top? Housing historically has cracked when mortgage rates have risen two percentage points above the previous trough. This time the 3.50% cyclical mortgage bottom 2012-2016 may have been artificially low, but no matter what the whole housing pricing structure was based on that bottom. Somewhere north of 5.50% housing will break, but we can hope that this time something else will break first, maybe in the global economy. The Fed is tightening for the outside world, too. 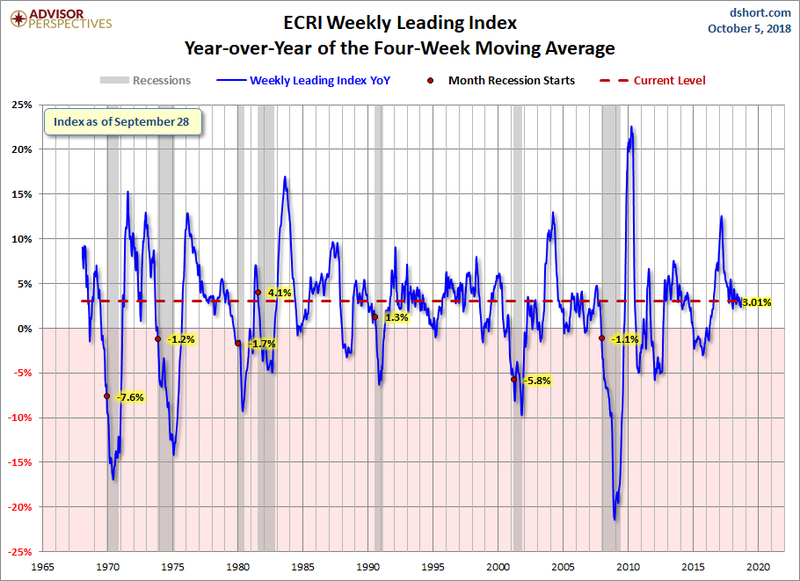 The ECRI does not show any dangerous acceleration in the economy. The Fed’s greatest unknown: how sensitive is this economy to rate increases?